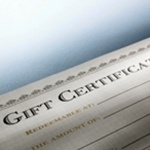 We love to play it old school, and that means offering old fashioned paper Gift Certificates. You know what we mean, right? You get to write in their names, hand your friend, co-worker or loved one something tangible that they get the pleasure of opening. Just order up the denomination here that best suits your wallet and we will mail it out to you, or we can even mail it directly out to your giftee with a personal message.